The salt marshes on Bornholm are natural low-growing due to the bedrock lying near the surface of the ground. 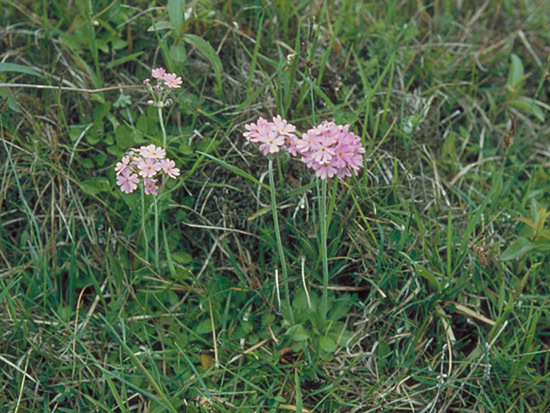 Primula farinosa in the left picture grows in large populations many places on Bornholm along the coast. It is nearly extinct in the rest of Denmark, where it can be found in a few places on Seeland. Other interesting species in the salt marshes on Bornholm are Tetragonolobus maritimus, Samolus valerandi and Cladium mariscus. by man as the plant in earlier times was used for colouring clothes - a practice that is somewhat modern again. 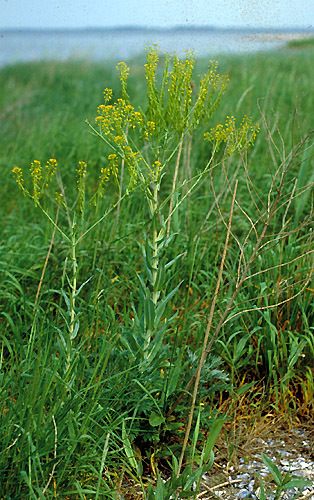 Othre species of plants on the coasts of Bornholm and not seen elsewhere in Denmark are Scutellaria hastifolia, Rumex bryhnii and Allium schoenoprasum - a species wich here is not introduced. Back to The rocky coasts of Bornholm.